This kale salad is about to set it off in your mouth! It’s one of my faves. It’s been well over two years since I discovered Food Basket Farm delivery service and I’ve been a loyal customer of their’s ever since. You can’t beat their prices on fresh, organic produce straight from the hills of Jamaica delivered to your door! My most common purchases from them are kale, spinach and their mixed salad greens. I use them in my daily green smoothies, however, I have been having a lot of prepackaged salads lately and so I decided it was time to start making my own, especially since store-bought salads are primarily made of iceberg lettuce and you know how I feel about that. 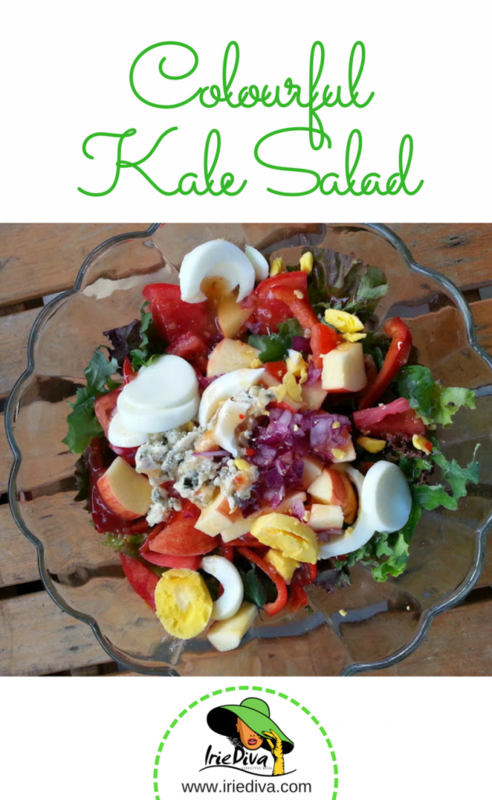 Enter, my summer kale salad that got so many likes, comments and requests for the recipe on Instagram that I just had to share it with my blog readers as well. 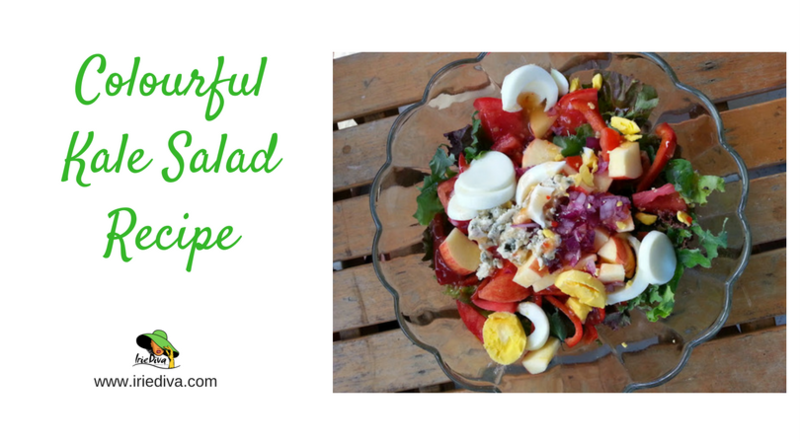 Made with primarily locally-grown organic ingredients, this salad was delicious and more colourful than my usual store bought salads for sure. My mother watched keenly as I made it because she wants to be healthier and said she wanted to learn. I said “Mom, this isn’t learned, this is imagined!” I imagined the flavours that I wanted to taste and threw them all into a salad. In my salads I like sweet, crunchy, salty and filling and I imagined the kinds of ingredients that would accomplish this goal. And dressed with light Italian vinaigrette. Normally I would make my fave homemade dressing but I was out of honey. I’ll share that with you another time. Mix it all up to let the vinaigrette work its magic and boom! Party in your mouth. The only thing that I really wanted to add but was out of was some nuts; almonds, pecans, walnuts or cashews are my fave salad nuts. Some avocado would have set this off amazingly too. 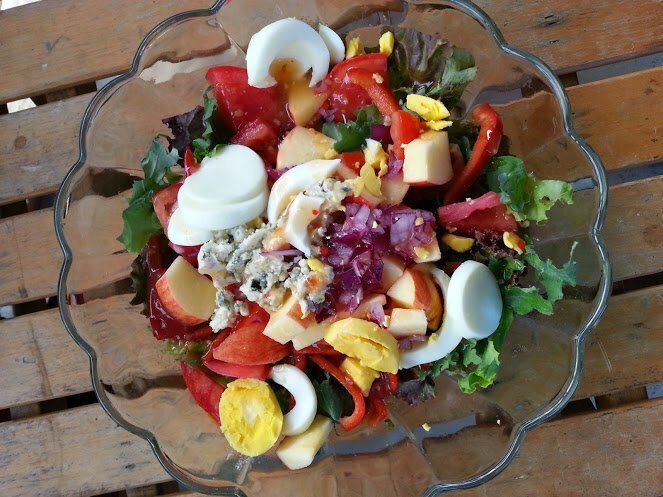 What are your favourite summer salad ingredients? I have a few more salad recipes up my sleeve. Salads come in a hundred million forms and so on this health path of mine, I surely have discovered more than a few that have been dubbed my fave. Let me know if you’d like to see more salads!